I vividly remember the advert for these bikes it was a cyclist (No idea who). Standing in full Peugeot kit with the bike held at full arms length above his head, striking and impressive. B.I.T.D. it had a full French build (unsurprisingly) Stronglight A9 H/set, 107 chainset, BB, seatpost. Simplex gearing, Maillard hubs, Atax bars and stem. The only thing I am fuzzy about are the brakes, I think they were Weinmann Carerra. Note the Turbo saddle, which Peugeot were putting on their top end bikes by ‘83 and the toe clips. Of course RM’s race set up may have been different. Hi DSH, that is an excellent link you attached, lots of Peugeot loveliness on there, much appreciated. Over past weeks I have been slowly accumulating parts, I will get some photos up shortly.. The standard 'off the shelf' bike originally was supplied with a Simplex SLJ5500 R/D, and on later versions of the bike it was an SLJ6600 T/SP... Simplex parts alone is a minefield and very easy to think that you are looking at one type of R/D when in fact it was something completely different. For the actual team bikes, they used a Simplex LJ4000 CP/SP rear derailleur. This was further modified by drilling holes in the jockey wheels and jockey wheel cages to reduce the total weight to 145g! I managed to find a standard version (a hefty 170g!). interestingly the body is made of delrin plastic. Odder still, instead of a standard allen headed bolt to attach to rear hanger on the frame. it has a bolt that feeds in from the other side of the hanger and clamps the derailleur to the frame. Unusually on mine it has a gold Simplex logo on a black background (all the images I found of these have a black Simplex logo on a silver background) has so I don't know if this a special version, or just an early version? it is possible to get the decals for these so I shall ponder on changing it.. So the postman has been busy. I have had to scour the world for the right bits. What did people do before the internet!? The off the shelf bike and the team bikes, used Maillard Professional 700 hubs. I don't think they used helicomatic (couldn't find any evidence) so managed to score some standard hubs. The early versions had a black dust bearing seal (late 1970's). The correct ones have a metal bearing seal. A lot of Maillard hubs look similar so it takes some detective work to make sure they are correct. The ones I got were badged spidel. They are really well made and spin very smoothly. They are an unusual design for the cones as they incorporate the bearing seal. And here they are greased up and polished. You can get decals for them so I will get that sorted.. In the end got some near NOS quick releases for £10 (result!) as the originals were a bit far gone. Next bits through the letterbox have been the chainset and bottom bracket. The challenge here is trying to find the correct bottom bracket. It should be a Simplex 650 with titanium axle but haven't found one yet, so to keep the show on the road, I managed to source a Simplex Competition BB near nos. Oddly the frame and forks have british thread, and you guessed it.... most of these French parts that I have found have been French thread! For info the correct length Stronglight BB for a double chainset is 118mm. 124mm is for a triple..
Chainset is a Stronglight 107. nearly all I found had French pedal threads. You can get them reamed out for English thread pedals, but that sounded like hassle, so I eventually tracked the ones I wanted from a seller in Canada! they are in superb condition. Some of the black highlights have rubbed off on the chainrings, but they otherwise look unused and as this isn't going to be a show bike build (nothing wrong with a bit of patina) they fit the bill. They are really nicely made.. The freewheel would have been a Maillard 700 Professional. I read somewhere that for mountain stages Robert would have used a lighter Zycral version. I managed to find one (looks a bit worn to be honest so will see if it is any good), but compared to a standard steel one which I had in the garage I did a weight comparison..... look at the difference! So good news is that decals are on their way, Rims are also on their way. I couldn't help sticking a few bits on to get a 'flavour' of what it might look like (and to stop this thread getting too boring). 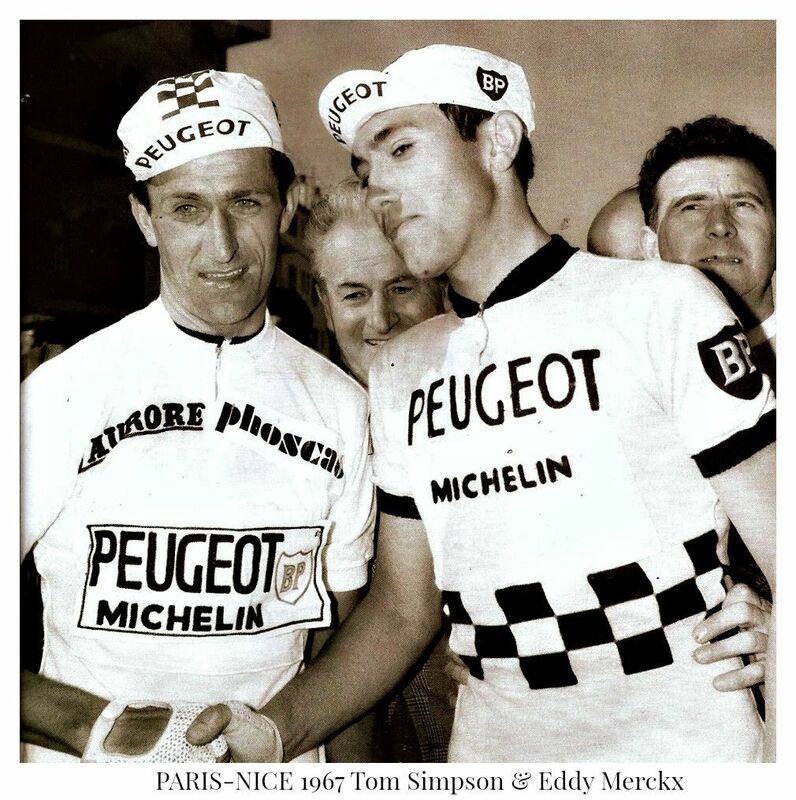 I love that classic Black and White Peugeot team kit. Always reminds me of Tom Simpson. Nice Build !! I agree, one of the best ever team kits! many thanks! So getting some momentum now. Rims have landed- some nos Mavic Argent 10 rims. It will be a shame to put some glue on them! These will be off to the LBS to build the wheels this weekend. I appreciate not quite the original Mavic Service des Courses rim but I haven't seen a pair that 1. weren't a stupid price and 2. couldn't prove they weren't 'fake' i.e a set of standard rims with stickers on! these were actually good value (that is what I told the better half anyway).. and they have the finish I was looking for- not too bling. I am starting to think I am losing the plot in the name or correctness- finally I managed to find the correct unobtanium bottom bracket (titanium axle) but it had French threads, So then bought another bottom bracket just for the correct English thread cups to match the sealed bearings. Aside from the cost - please tell me there are others reading this with the same affliction!! Feel free to share similar tales of obsessive behaviour to make me feel better!